Purists of the sport claim that it was started in 1997 in Leicester, East Midlands, England by resident Phil Shaw in his back garden. Shaw came home from what he recalls as a hard day in a Leicester knitwear factory. Preferring the idea of an evening out rock climbing, he decided to combine the two activities into a new extreme sport. In June 1999, Shaw, who uses the nickname "Steam", embarked on an international tour to promote the activity. The stops included the United States, Fiji, New Zealand, Australia and South Africa. An encounter with German tourists in New Zealand led to the formation of a group called "Extreme Ironing International", and the German Extreme Ironing Section or GEIS. As extreme ironing has branched off, the conditions can gain in extreme activity. For example, a branch of ironing has been developed that includes both bungee jumping and well-pressed clothing. Bungee ironing is what some would call the ultimate in the thrill of extreme ironing. The "sport" gained international attention after a documentary entitled Extreme Ironing: Pressing for Victory, was produced for Britain's Channel 4 by Wag TV. The program followed the British team's efforts and eventual Bronze and Gold placings in the 1st Extreme Ironing World Championships in Germany. A side-story looked at the rivalry between the EIB (Extreme Ironing Bureau) and a breakaway group called Urban Housework who were trying to establish their own extreme sport based around vacuum-cleaning. The film later aired on the National Geographic Channel. In 2003 the Rowenta Trophy was won by a group from South Africa by ironing across a gorge at the Wolfberg Cracks. In 2004, the EIB traveled to the US on the Rowenta Tour to recruit additional ironists and ironed at Mount Rushmore, New York, Boston and Devils Tower. In March 2008, a team of 72 divers simultaneously ironing underwater set a new world's record for number of people ironing underwater at once. On 10 January 2009, 128 divers including 6 freedivers, attempted to break the previous world record, managing to confirm 86 divers ironing within a 10 minute period. The event took place at the National Diving and Activity Centre (NDAC) near Chepstow, Gloucestershire, UK and was organised by members of the Yorkshire Divers internet forum. In addition to breaking the world record, the event raised over £15000 for the Royal National Lifeboat Institution. On 1 May 2010, a group of Dive Centers in Key Largo Florida are attempting to take claim of the record. The event is part of the Conch Republic Days in the Florida Keys and will be attempted by Keys Diver, Silent World Dive Center, and Captain Slates Atlantis Dive Center. The attempt will take place at the historic site of the Christ of the Abyss at Key Largo Dry Rocks. On 28 March 2011 Dutch diving club De Waterman from Oss set the new (official) World record extreme underwater ironing. A group of 173 divers set the new world record in an indoor swimming pool in Oss in the Netherlands. Because of their 40 year anniversary the De Waterman organized this event. On 18 April 2011, tenor Jason Blair was filmed ironing on the M1 motorway in London, UK, a section of which had been closed following a fire. In 2011, Extreme Ironing enthusiast William Hinton brought a new interest to the sport along America’s East Coast ironing many hikes along the Appalachian Trail as well as ironing numerous water activities including surfing and wakeboarding. 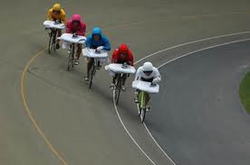 In my opinion these are the ten best stunts performed around the world in the sport of extreme ironing. Since the thrilling sport of extreme ironing was born in the United Kingdom, it makes sense that they've mastered the art. Short and sweet – this guy knows how to get the chores done. In speedy fashion he gains ground heading down a grassy hill, iron in hand, and takes a bold turn right in time to graze the shirt awaiting him on his ironing board. Who says you can't extreme iron in a city park – at least that works when adventuring in Japan. At first you think these crazy guys are just tied in to the side of a moving van attached to a soldered ironing board, but after they round a few curves the "van" takes to the water... Magically, this dual-purpose craft allows for two extreme forms of ironing, and to these Massachusetts pranksters that means double the pleasure. I know the state has much more to offer than this ironing activity. Apparently in Edinburgh there are circumstances under which emergency ironing is necessary. But luckily this popular pastime has quite a following in these parts, including this fellow who's one call in case you need him to run down the street after your dress clothes, iron in tow. Just try and block out the corny chase scene music track. I made an exception for this Austrian guy who didn't have a video camera – the video collage he got his friends to help him make shows just how much time they've got on their hands. Extra points for the matching spandex outfit and brightly-painted house off which he rappels. I'm assuming he likes to chat with neighbors passing by while he irons shirts, but I can't imagine he wears suits much at all. You can sky dive in England, and you can iron, but you can also to both at the same time. In fact, there are leagues dedicated entirely to the sport and regularly compete on points of style and creativity in extreme sky dive surf ironing, or whatever the league calls themselves. Watch as the teams prep for the big dives, there are a lot of clothes ready to hit the board. 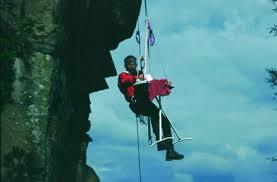 On your next trip to the UK look out for local Extreme Ironing competitions, they actually exist and can be attended! It isn't at all the first thing I'd think of when talking up Egyptian travel, but the famous Blue Hole, an incredible geographic asset in the middle the desert, has more possibilities than meets the eye. To this gal it was extreme ironing, and she succeeding in reaching her goal of being the first and only diver to iron at the bottom of this aquamarine-blue body of water. You think these two are just jumping out of a plane with snowboards attached to their feet, but before too long you see they've got other plans, to use the bottom of the board at the ironing surface for their own form of extreme ironing. I'm sure if you get in a few jumps on your next extreme sports adventure to England, that the instructor might let you try out some of these moves if the spirit moves you. I can picture these Kiwi guys arguing all the way up the mountain about who would carry the ironing board, but however they managed to drag it up there, it is one incredible place to iron. The view of snowy crags and a sea of rocky peaks makes for a nice ambiance, I'm just not sure it would be my first choice of activity after mountaineering to the top of this exquisite New Zealand Peak, but hey, that's just me. I'm not sure how this guy justified assembling this very complex rigging in order to conquer his ironing while rolling through New York's Central Prospect Park. I can only assume from his hilarious video that his thought many others would be interested in his design in order to replicate his fanciful strapping of a gasoline generator to a mountain bike and an ironing board. At least one of these extreme ironers actually ended up with a wrinkle-free shirt!